WØEA Blog! : Bugs, Paddles, and Keys, Oh My! Bugs, Paddles, and Keys, Oh My! Thanks to the generosity of Roger, W1EM, I have received the Jackson Harbor "Bug Descratcher" in the mail the other day. I have been having some issues with my bug's dirty, old contacts when keying my K2 using the rig's internal automatic detection (which uses a couple of diodes to somehow figure out that you're using a manual key). This should do the trick and clean up my half-dits and the keyer getting stuck in di-dah-di-dah mode. Right now I have all of my keys going into a box that combines the lines so that I only have one thing to plug into the radio. I'll be re-doing this box so that I can put the new Bug Descratcher in there as well as an old Picokeyer kit that I used before I had cw memories built into my radio. 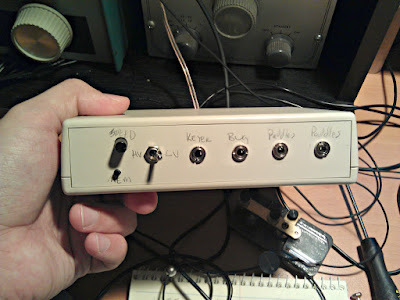 The PicoKeyer will be used with the solid state relay in the descratcher to key my HW-16 with a paddle. Below is a rough schematic showing how the internals will be hooked up. In order to have space for the Picokeyer controls (memory button and speed dial) I'll have to reduce my inputs from 5 to 4. 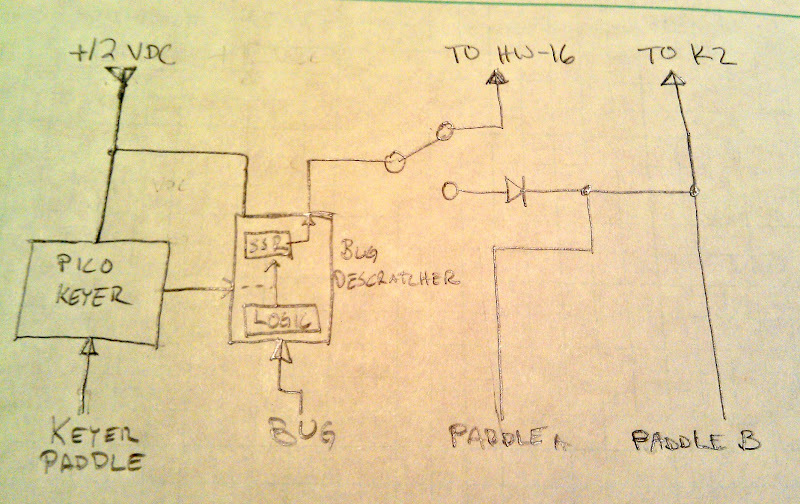 I'm also adding a switch so that I can use the output of the descratcher to key my HW-16 or my K2. 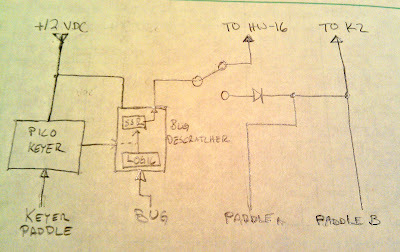 As you can see, 2 inputs feed directly into the K2, then there's the debounced bug input that goes into the Bug Descratcher, and another paddle input that goes into the PicoKeyer. The Picokeyer then feeds to the input of the solid state relay on the Bug Descratcher board so I can use the keyer with the HW-16. The diode at the switch is representative of the dual diode circuit that Elecraft uses to auto-detect bugs and straight keys on their rigs. I sat down around 6 PM and started to it. The Bug Descratcher is almost a non-kit, there's about 10 parts and putting that together only took about 20 minutes. Adding the Picokeyer was more difficult than I had anticipated. I built it back before I had a lot of soldering experience and used some bad solder (read: acid core) so when I tried to modify it a bit, I did end up ripping up a trace. I figured out where it went though and just wired up a jumper. The next difficulty was getting everything back in the box. I tried to put the Picokeyer in the box so that the push button that controls the memory would work but the way that the box is designed, the Picokeyer won't sit flat so the button binds up on the hole. Either I have to enlarge the hole or add an outboard button, which I may do anyway. The final results are above. As you can see, the insides are fairly jumbled but, hey, they work! Once I get a better pot for the keyer and another button for the memory, I'll make a new faceplate with real labels. So that is that. Next time you hear me on the air with my bug, this is what you can envision! See you again soon, 73!